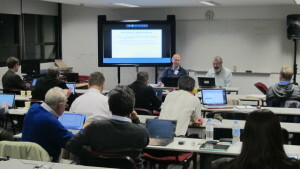 Old friends meeting once more, new colleagues met, spirited and robust discussions held, importance of SMPTE’s pillars demonstrated: these threads and more were evident in the first day of the Technical Committee meetings in at Randwick TAFE, in Sydney . Attendees came from the US, Germany, Holland, Japan, Korea, and even as far away as Melbourne. They were joined by SMPTE Standards Community members from around the globe who participated via telepresence. We had a special welcome from David Riordan, Director of TAFE Sydney Institute, who talked about the importance of standards across subjects taught in TAFE, and the need to champion standards as a performance metric. Telstra impressed delegates with performance of newly available network access solutions. Thank you to Kingsley McGarrigle & the Telstra Media, Entertainment & Technology team for providing the Telstra 4GX internet solution for the Technical Committee meetings. A highlight of the meetings was an evening visit to the Telstra Customer Insight Centre, where delegates saw an excellent example of how standards come together in a practical installation: a melding of video, audio, data, metadata, and so many other aspects of media technology for which SMPTE standards exist. As a special bonus we were given a demonstration of the Meyer Constellation audio system by its inventor and developer. Being a fly on the wall at the SMPTE Standards Community meetings is an interesting passtime. You can learn a lot about the standards setting process, and many people have progressed from observers to active participants. If you want to attend a TC meeting as a guest or observer, it’s always possible. There’s no charge, just important conditions to agree to observe. Information about how to get involved is on the SMPTE global website. Just head for http://help.smpte.org and select Knowledge Base. We certainly welcome guests. All we ask is that you sign and submit the Guest Participation Agreement. This just puts you under the same rules as the participants. It does NOT provide access to the documents under discussion. The best background information is the meeting reports (that link will point you to the report from the March meetings held in San José, and published just before NAB). The report gives an extensive overview of everything going on, and links to the public views of each project.